Since a few years I'm also interested in Asclepiads, mainly Stapelia, Huernia and Ceropegia. Next year I will try to keep some Brachystelma species, but they seem to be quite difficult to keep alive for more than 2-3 years, but we will see. Here are some pictures of some of my plants and a list of species I have at this moment. Ceropegia stapeliiformis clone 2 "grey"
And several species I don't know which one it is. That's it for now, more next spring hopefully. Still searching for some species. Since a few months we have a greenhouse so collecting could start again. 10 species of Ceropegia, C. armandii, C. stapeliiformis, C. woodii, C. linearis, C. simoneae, C. sandersonii, and some other species I forgot the name of. What a fascinating collection of plants. I've never seen half of those genera, let alone the speces you have. Awesome! I think Ceropegia sandersonii is perhaps the most alien looking plant I've ever seen. I like Brachystelma a lot too Willem, the two species i had but both flowered and grew well for me but died after their second winter, i suspect from fusarium or a other pathogen as I had some black spots on some mideast stapeliads the same year. But i don't think il be adding many more Asclepiads until i have a frost free green house i'v pretty much run out of space, I did get a few Ceropegia cuttings last year along with Hoya's most of which are doing well. Will order some Brachystelma's soon. I know they're really hard to keep alive for a period of time, but at least I want to give it a try. 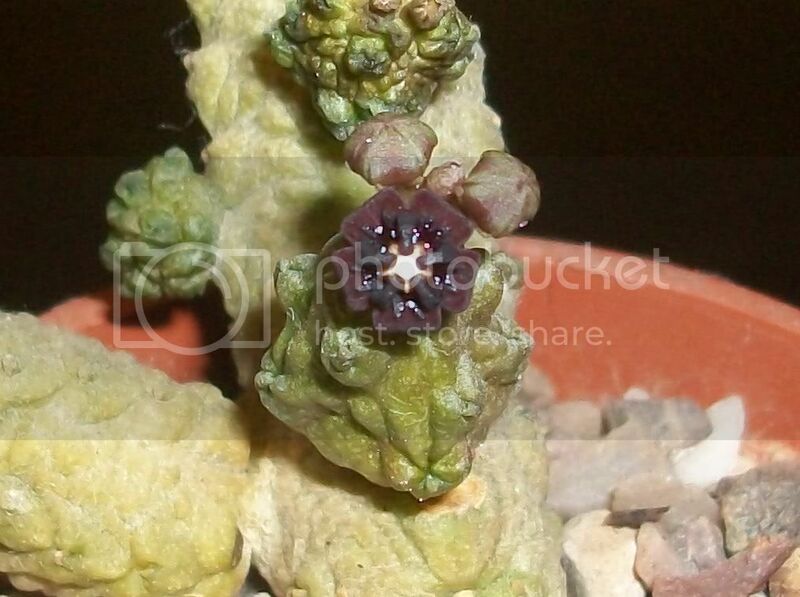 Also trying to get some Pseudolithos, some Huernia's and some more Ceropegia's. Whitch species of Brachystelma did you have Frylock, I'm thinking of getting B. maritae, B. filifolium, B. barberae, if I can find them. I know Ernst Specks sells some species. And how did you keep them, placement, soil and watering? Brachystelma bracteolatum and Brachystelma buchananii were the two i had Willem both grown with the tubers exposed as much as possible and almost no water in the colder months, but I have feeling being tropical African they would have faired better grown under lights and watered all year round. If do them again and there not any of the South African species i will try growing under controlled conditions not a greenhouse or windowsill, B. buchananii im sure to grow again sometime very nice flowers i did post some flower pictures from it a few years back they should still be here somewere. If I get them (Brachystelma) they will be kept in our greenhouse, which has condictions suitable for South(ern) Africa species. But still they're very difficult to keep for a longer period of time. From what I have heard is that they need to be kept cooler in winter, around 14 degrees celsius and dry. In summer moderate watering and letting them dry out between watering. And lots of sunlight. But still they like rotting more then flowering. That B. buchananii is also very nice. How did you discover and get into this group btw? Just wondering, I'm into carnivores myself, but always interested in how other lunatics get obsessed with certain groups of plants...you start with a couple then later it's like 200 and suddenly the house is more of a greenhouse with human pests living inside! My dad used to have some cacti and a few succulents. Read some of his books and got interested in the Asclepiad group, this was about 15 years ago. 5 years ago I started to collect Stapeliads and since 2 years it got a bit out of hand, even my dad started keeping cacti again. That's why we got a greenhouse. My mom likes some of the Ceropegia species, so she has of them in the windowsills. One of my dad's Pelecyphora species. Duvalia sp. IB74453 flower open for a few hours, the flower petals are allready curling. Hour later, fully opened and the flies were already flying around. Brachystelma maritae, rare in the hobby, really difficult to keep alive for a longer period of time, they like rotting more then living. Got a really nica package last friday, some really interesting species. Ceropegia woodii, already flowering, normally they start in early autumn. Fascinating! I like a lot of cactus and succulents. nice garden, so good see happy plants! !